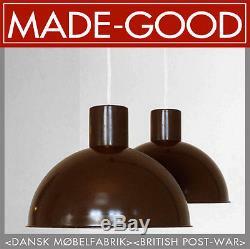 Made-Good would like to bring you the best in Danish and British post-war furniture and collectables. Retro mid-century vintage furniture for the discerning customer. The item "2 60s 70s retro vintage DANISH METAL PENDANT LIGHTS HAMMERBORG FOG MORUP STYLE" is in sale since Tuesday, March 18, 2014. This item is in the category "Home, Furniture & DIY\Lighting\Lampshades & Lightshades". The seller is "made--good" and is located in Bournemouth. This item can be shipped worldwide.